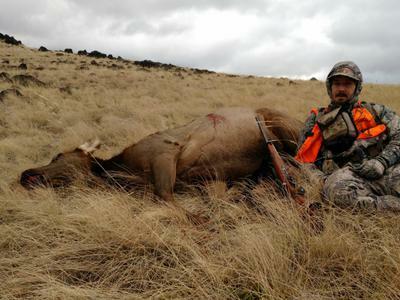 I killed two cow elk this year with a rifle. 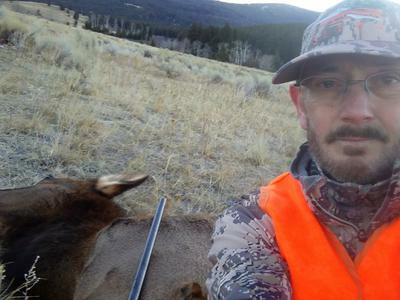 I prefer to kill an elk with a bow, but all I managed to do during archery season was to slap a nice bull with an arrow sideways! I worked hard and very successfully to get set up for an ambush on a 6X6 as he moved his herd from feed to bed. I stopped him right in the only window with a cow chirp. I had already ranged him while he was moving, but I misjudged the distance where he stopped as 40 yards. (He was more than 40 yards out.) I held my 40 pin dead on and my nock barely tapped a fallen tree trunk as my arrow went over it. That tipped the arrow nock up and the arrow slapped hard against the bull's chest! He and the other two bulls with him tore up some dirt. All the cows behind them panicked, as well. I am going to spend some time practicing guessing distances and then checking with my range finder this coming year. My store, Elk Tips Outdoor Gear, puts on a 3D shoot during the summer. I'm going to shoot it this year, not just run it! 3D shoots are a great way to practice guessing distances on life size animals before the season starts. The cow rifle hunts were fun, though! The freezer is full of organic, grass fed, lean red meat. After hunting a ridge thoroughly and finding no elk, I went back down to the bottom to head out. Then I saw "a hundred" head of elk running to the other end of the same creek bottom. I knew they would go around the other end of the high ridge and cross to the next drainage. They were under pressure from another area. I scrambled hard to the top and moved fast toward the other end where I hoped they would cross. I got there just in time to see them slowly moving across with their tongues hanging out. It was difficult to find one away from the herd, but I finally did. The weather improved a great deal for a beautiful day for the second kill. I kind of had to press past a couple of other hunters in the dark of morning. I saw them feeding early on a high hill top. I guessed corectly where they'd come down and got an easy 170 yard shot to fill my second cow tag.